That weekend in the countryside the maincourse was a buffet with plenty of options. 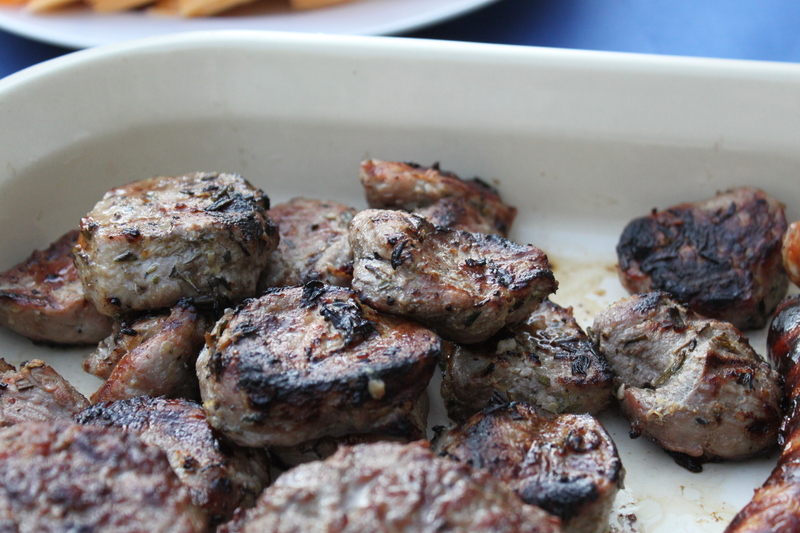 We had sausages and burgers from Waitrose as well as chicken drumsticks with sweet chilli marinade and marinated pork fillet with lemon and herbs. For the sausages and burgers we had buns, mustard, ketchup, mayo, sliced tomatoes, onions and pickles. The other trimmings were a regular salad with avocado and spring onions, couscous salad with grilled peppers and chickpeas, bean salad with Dijon and feta, classic potato salad (with parsley instead of dill) and slaw. Trim the meat of any fat/tendons and cut into 1 inch thich slices. Flatten them a bit. Season the meat. Mix the marinade and cover the meat (either in ziplock bags or a ceramic tray/bowl. Leave to marinate in the fridge at least over night or for 48 hours. Barbecue. Pingback: First week of holiday!